Cooler weather is fast approaching and so begins the start of the season’s wonderfully delicious fall harvest! There is nothing more inviting than walking into your home on a chilly day and smelling an amazing soup simmering on your stove top! Roasting vegetables is a great way to enjoy fresh seasonal produce in an easy way and at the same time make your house smell AMAZING! This simple stew brings the flavors of sweet potato, butternut squash, carrots, and eggplant together into one giant bowl of nutritious delicious LOVE! Even though this recipe contains neither meat or potatoes, I decided it was more of a stew than a soup because it is thick, hearty & filling! I personally think it pairs wonderfully with a grilled cheese sandwich! Mmmm! Here are the veggies getting ready to be roasted! 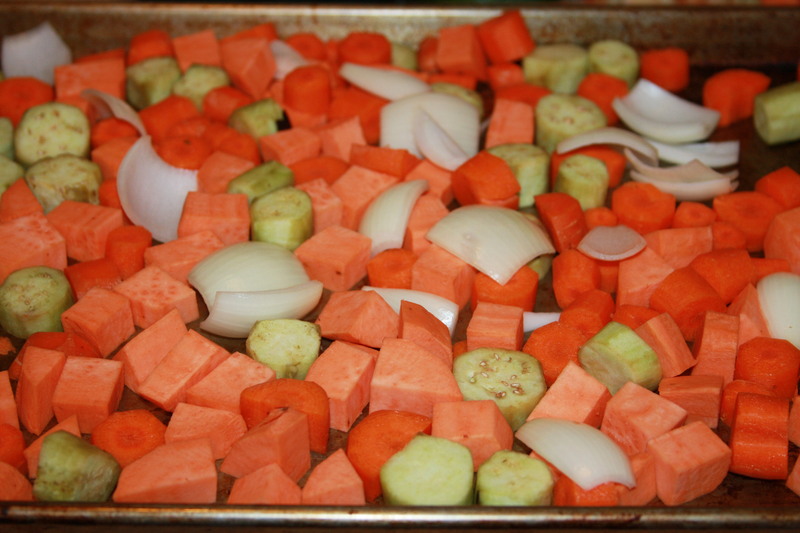 Preheat oven to 425 F. Cube all the vegetables (except the butternut squash) to roughly 1″ chunks. Put them all on a large baking sheet and drizzle generously with olive oil, & a little salt and pepper & mix around. Place the butternut squash (flat sides down) on a separate oiled baking sheet (I like to put mine on a sheet of oiled tin foil). 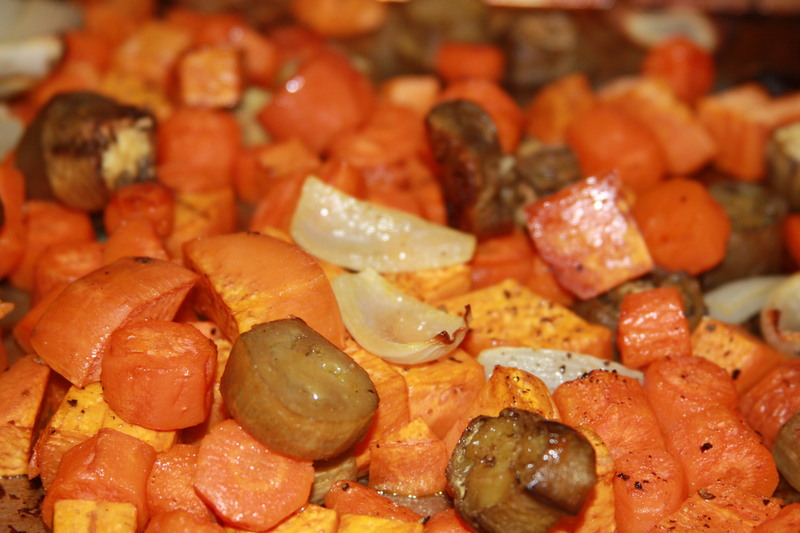 Cook vegetables until soft, about 30-35 minutes but leave the butternut squash in the oven an extra 15 minutes. (I put the veggies on the top rack and the squash on the bottom rack of the oven.) . Once the butternut squash is done, set it aside to let it cool slightly. After roasting... don't sneak too many bites! You'll need them for the stew! Once the butternut squash is cool enough to handle, scrape it out of the shell and puree. Pulse/puree the roasted vegetables with the broth in batches in your food processor. Combine it all together in a large stock pot and add parsley, salt & pepper to taste. Continue to simmer until ready to serve and garnish with fresh herbs if desired. Enjoy! 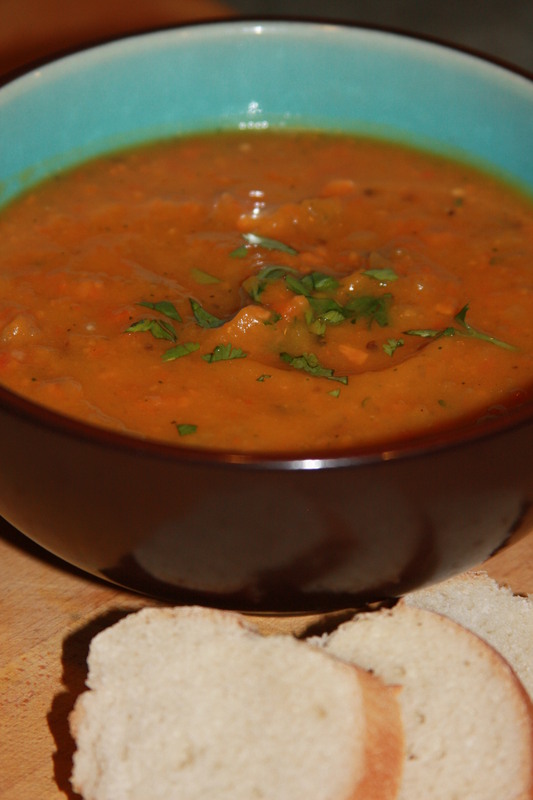 This stew is great with bread... and it's even better with a grilled cheese on the side for dipping! 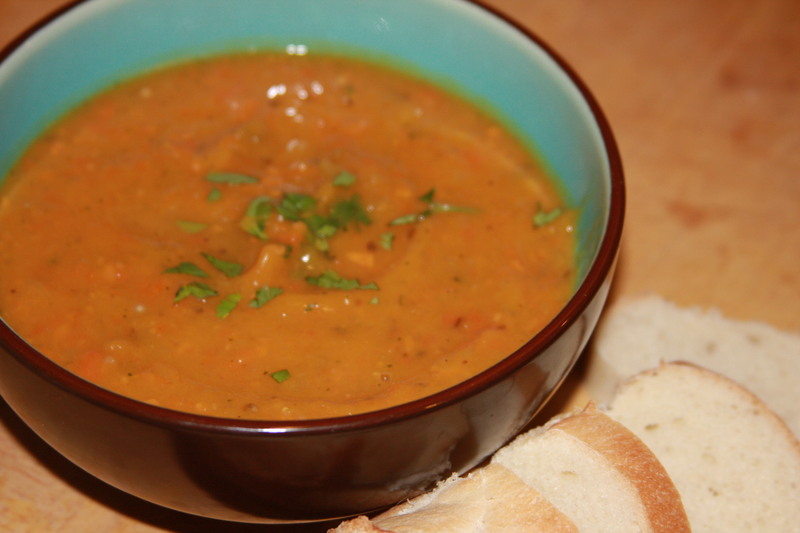 This entry was posted in dinner, fall, soup & stew, Vegan, vegetables and tagged butternut squash, carrot, cooking, dinner, eggplant, food, lunch, roasted vegetable stew, roasted veggies, seasonal, soup & stew, stew, Vegan, vegetarian. Bookmark the permalink. Sounds delicious! Mmm… with a nice loaf of freshly baked bread! Might do this one up aqt the cabin! This stew is awesome!!! Super easy and definitely hearty. It will be great for the wintertime.